Set to open at the Burrinja Gallery just out of Melbourne is an exhibition of one of the great artists of the Kimberley, Jack Dale Mengenen. 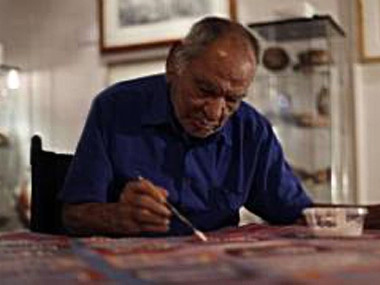 Jack Dale was famous for documenting aspects of his culture and key moments of his life, and for painting race-relations in the Top End during the post-settlement period. He had witnessed as a young boy chain gangs of Aboriginal men being marched to the Prison Tree in Derby, as a stockman he had witnessed the floggings and cruelty of the station owners, and as a young man he had also seen the bombing of Roebuck Bay (a coastal area of the Kimberley) by the Japanese during WWII. This exhibition brings together a selection of Jack Dale's large-scale paintings of Wandjinas (water spirits of the Kimberley). 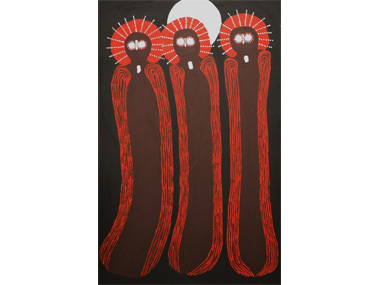 Jack Dale had painted Wandjina as ghost-like creatures with halos and large pool-like eyes both individually and in groups without a mouth because, according to the artist, giving them a mouth would mean the rain would never stop and water would flow endlessly. Though when he died in 2013 Jack Dale had not achieved the reaches of fame of other Kimberley artists like Rover Thomas or Queenie McKenzie, his works are beautiful, strong and significant - and for the moment they remain within our reach. But investment aside, the gallery setting of Jack Dale's assembled Wandjina spirits creates a remarkable and powerful arrangement and for this reason alone it is well worth the visit. Running from 28 February through to 22 March, the official opening is on Sunday 1 March at 2.00pm.